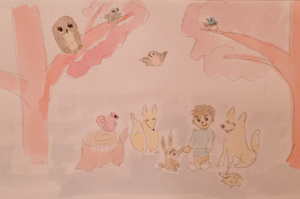 Mavis the Magic Dog: Sakura the Squirrel and the Terrible Storm (Magic, Nature, and Shinto) – Japanese Art, Books, Culture, Gifts, and Publishing. The second book of the series about Mavis the Dog and the Japanese boy called Ryo is a real gem. This is based on the natural adventure of this children book series that is reaching out from the foundation of the first book. 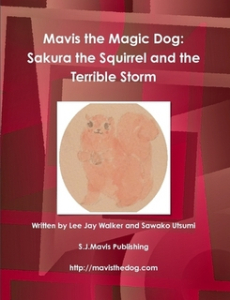 Therefore, Mavis the Magic Dog: Sakura the Squirrel and the Terrible Storm moves on naturally from the first book in this series titled Mavis and the Magic Curtain: The Little Boy Ryo and the World of Shimabara. 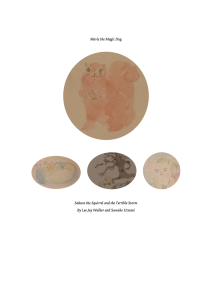 In this second book, Sakura the squirrel is predominant and new animals also enter the stage – from badgers to a clever fox. Equally important, the power of Shintoism that blends naturally with nature comes to the fore when entering the Dark Northern Forest. Sakura, afraid and scared, wonders into the Dark Northern Forest. This reality sets off alarm bells and before long a search and rescue team is put together containing different animals. However, prior to entering the dangerous Dark Northern Forest, the world of Shintoism gives guidance based on the mystical power of the Dosojin. Overall, the second book fits naturally within the world of Mavis the Dog and is a lovely treat for children. The beauty being the book is open to various age groups based on the varied focus in relation to adventure, animals, magic, friendship, Japanese culture, mysterious sayings, and other intriguing areas. Also, the book is great for studying at school given the complexities and adorable themes of nature, magic, self-development, and aspects of Japanese culture.